Recently a friend posted on a question on Facebook about where to see good Mid-Century Modern architecture in Kansas City. 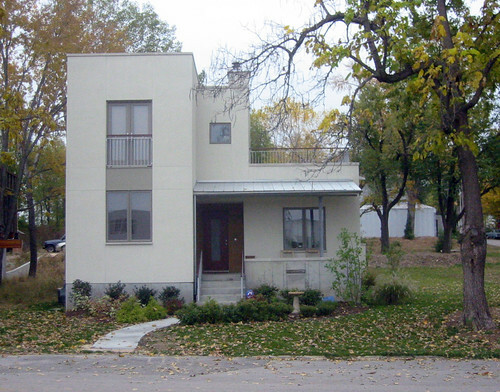 I'm not to familiar with KC'c MCM neighborhoods, but was going to post the location of my favorite house in the city, which my cousin many years ago referred to as the E house. 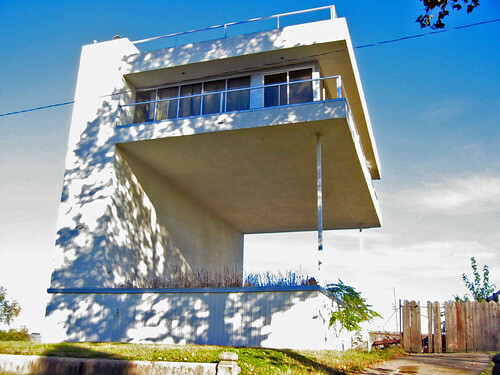 The unique structure, also apparently known locally as the inverted L house was perched on a hill in the Westside neighborhood just southwest of Downtown Kansas City. The house it turns out was not MCM, but the vision of an eccentric business man named Jim Tharp in the early 1980's. I looked on Google maps to find the home's location, but couldn't find it where I thought it was located. After finding some photos I had taken of the house around 2005 I noticed the red brick home in the background of the photo above. After consulting Google again, I realized the head turning home was gone! Who would demolish such a unique structure? 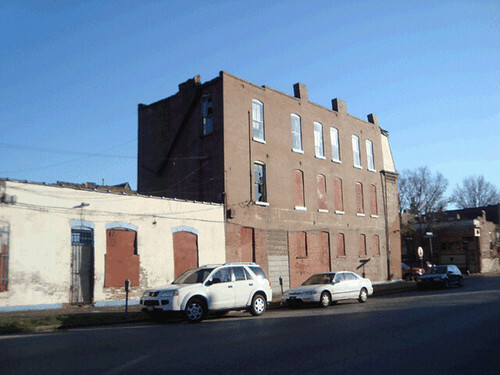 According to an article in the Pitch from October 2006, a pair if shameless real estate developers had slated the home to be demolished the following year and the site along with several adjacent vacant lots were to be filled with a new development of eight Victorian style million dollar plus McMansions. The house may have been demolished for nothing, as six years later aerial views show no neo-Victorians on the vacant land, although the development's website is still active. 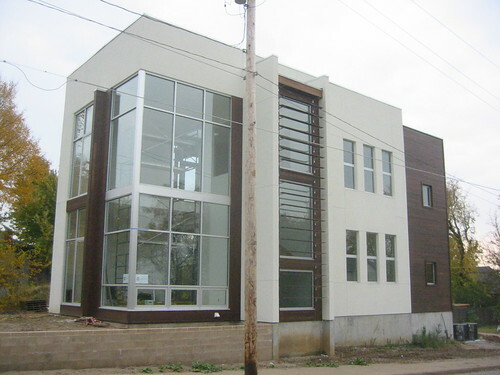 Several photos of the demolition of the E house were posted on an a KC development discussion forum. 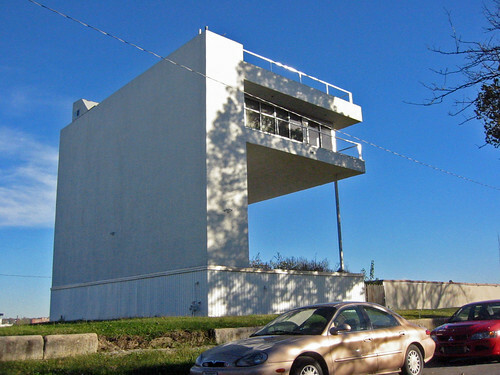 At one time a Wright inspired condo tower was proposed to be built on a vacant site just south of the home. The renderings strangely show the E house in the background which would have been completely overpowered by the view blocking tower. The tower was never built either. The demolition of such a blatantly modern home in Westside is sad, especially since the neighborhood, which was originally developed in the Victorian era has become an attractor of many new contemporary infill structures in the last decade or so. 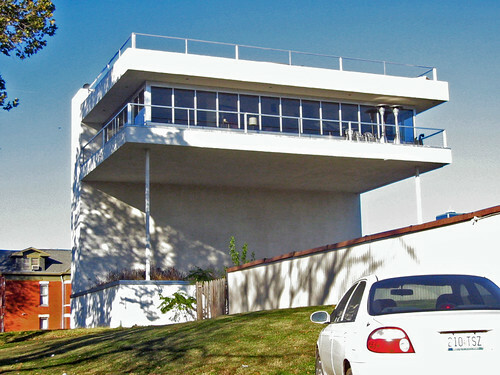 These are a few I photographed in 2005 and many more contemporary homes have been built since then including a home by the architectural firm El Dorado, and a mixed use corner building housing framework design. 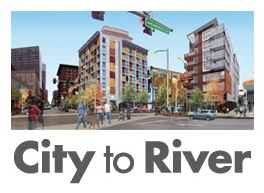 Also nearby is a development of modern townhomes overlooking Downtown Kansas City and a very contemporary rehab of an older house. At the intersection of Cherokee and Nebraska Streets were two 3-story mixed use buildings constructed within six years of one another near the dawn of the 20th century. Both have had structural issues, specifically load bearing masonry walls leaning to the east. 2857 Cherokee, constructed in 1902 at the northeast corner of the intersection has had its facade completely re-built. It is unclear whether this was due to a structural condition, or if it was simply a modernization, which was popular in the 1950's and 1960's. 2900 Cherokee, kitty corner to 2857 and constructed in 1896, had a problem with its entire east wall leaning out toward Nebraska. 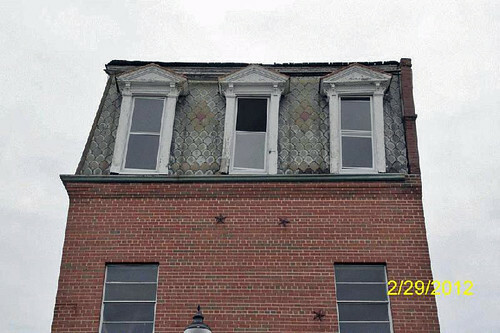 In November 2008, the building was inspected by the Building Division and condemned for demolition, presumably due to the east wall condition. Instead of demolition however in early 2009 work began to deconstruct the entire east wall and construct a new wood frame bearing wall. Apparently the south wall also had issues as it was also completely removed. The photo above shows how far the wall was out of plumb. Note the the gap between the frame wall and the masonry which expands to what appears to be around one foot at the top of the 3rd story. Later in 2009, masons were in progress re-laying the original brick from the east wall as a veneer over the new framed wall. Here is a view of the completed work. Other than a cleaning the brick to restore a consistent color, the wall appears just as it had from the exterior. As of this year, the building was still boarded, and it us unclear when it will be occupied (the same LLC has owned the building since 2004), but with the investment in re-building the problem wall we can likely rest assured that it is going to remain at the intersection for the long term. 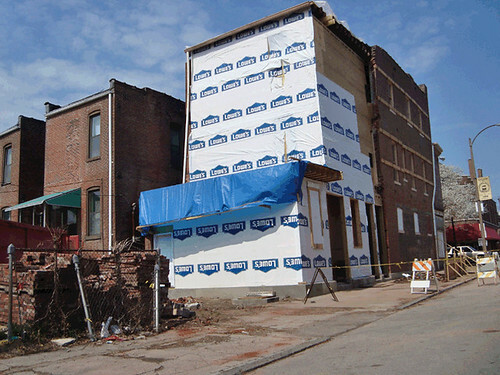 Back to 2857 Cherokee: This photo shows how the entire third floor of the building leans several inches to the east. 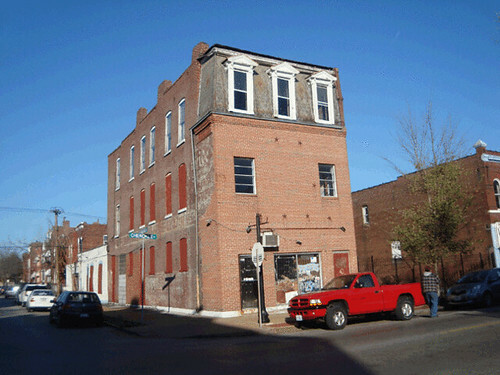 In July 2009 it was condemned for demolition by the City, and then LRA is shown in City property records as taking ownership in 2010 after three different owners since 2004. There was also apparently a large crack at the southeast corner of the building running the height of the building. 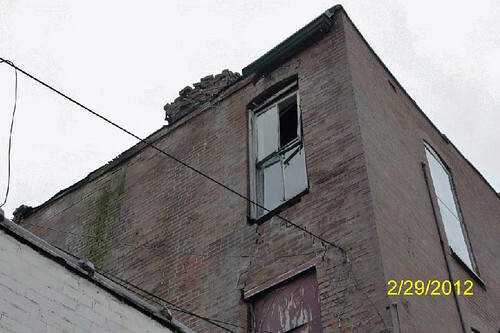 This photo shows clearly that the front portion of the third floor wall leans east, but that this condition appears to gradually lessen as you move north toward the back of the building. The first two floors of the west wall appear to be free of defect. The photo below shows some minor settlement cracking around the windows of the rear wall and a need for tuckpointing due to the lack of a gutter. What like a pile of brick or possibly a collapsing chimney is a very minor issue, and otherwise the rear of the building appears sound. 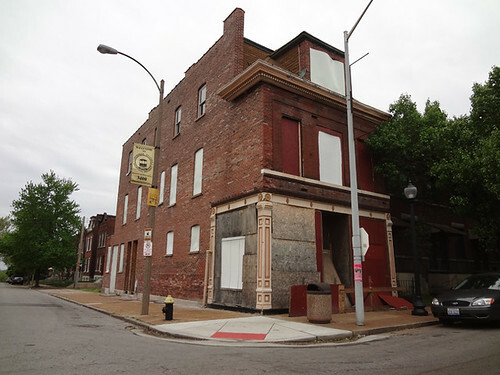 Although located in the Jefferson Gravois Streetcar Suburb Historic District, a permit for demolition was granted after application was made by LRA on april 16th of this year. This begs the question: Did LRA attempt to market this building at all after acquiring it? I don't recall seeing an LRA "For Sale" sign. 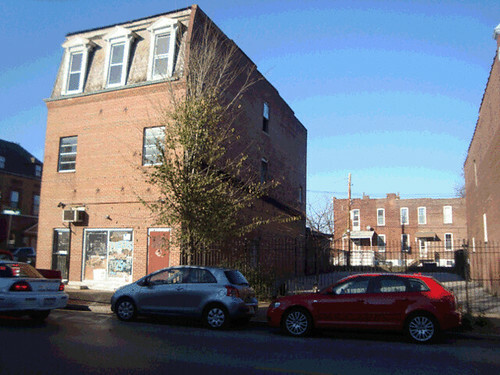 If a building owner on the opposite corner was willing to re-build the entire east and south walls of a condemned building, surely 2857 Cherokee could have been purchased from the LRA by someone who could have re-built the leaning portion of the third floor and possibly the first two floors of the front facade if the crack at the southeast corner warranted. 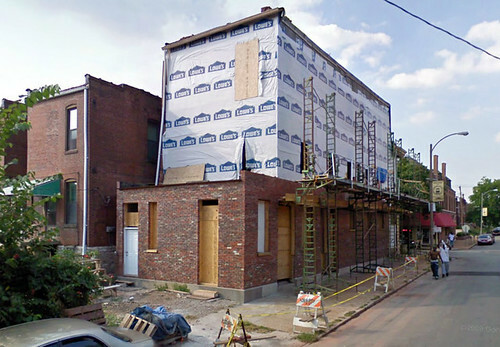 While the modernized brick facade is regrettable, there are many things a new own could have done after dealing with the third floor to improve the looks of the front of the building if the facade didn't need an entire re-build. 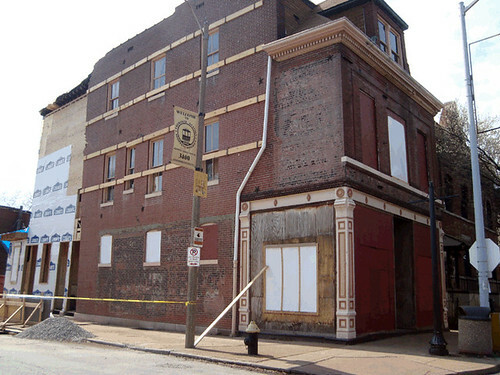 These could have included new windows, adding a third window to the second floor, adding a period appropriate cornice, adding an awning over the storefront, etc. Instead, the building is now under demolition and we will be stuck with a vacant LRA lot for the foreseeable future. Next door at 2853 Cherokee, a paved lot is now owned by the Cherokee Station Special Business District. Not long ago this parcel also contained a building shown below. The one story structure was condemned for demolition in December 2002 and demolished the following year. The paved lot does not appear to be used for parking as it is not striped and fully fenced at the front and rear. To have grown up going to St. Louis Centre to shop or just hang out and then revisit the top floor of the former mall building today is to enter into the realm of the surreal and the absurd. 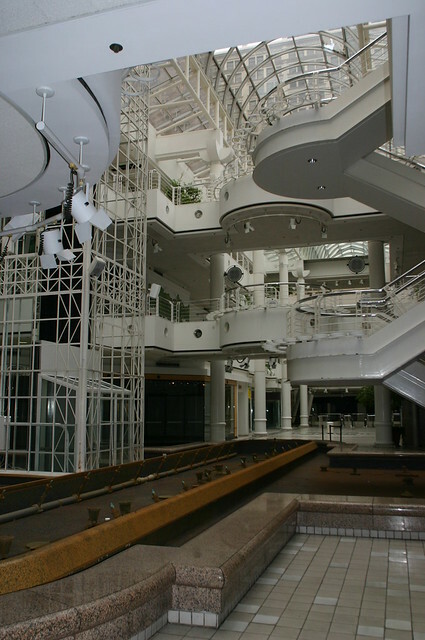 Gone is the bold white interior, the four story atriums, the chrome handrails and the fountains, all stripped out to the bare structure covered with spray-on fireproofing. The atriums have been filled-in with new concrete floors and ramps. Instead of retail stores and a food court, the wide open spaces are now filled with cars. The giant block long central barrel vault skylight however remains, as do the smaller barrel vaults at the north and south ends. How did we end up with yet another parking garage? In 2006 law firm Thompson Coburn, which occupies 240,000 s.f. 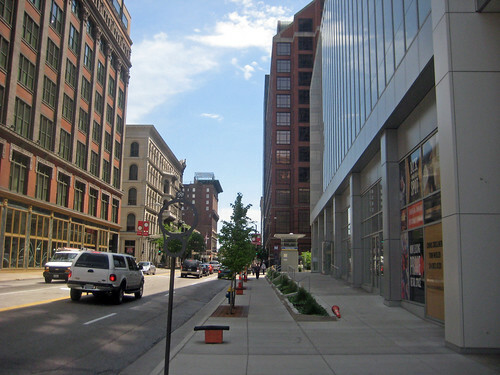 in the US Bank Building, began a search for potential new office space as their then current lease would be up in 2010. One of Thompson Coburn's favored locations was a $568 million mixed use development that Brown Shoe Company had proposed for redeveloping their headquarters campus on the western edge of downtown Clayton. In order to keep Thompson Coburn Downtown in the building where they had been located since the building was constructed as the Mercantile tower in 1975, having parking connected to the building was considered a must. 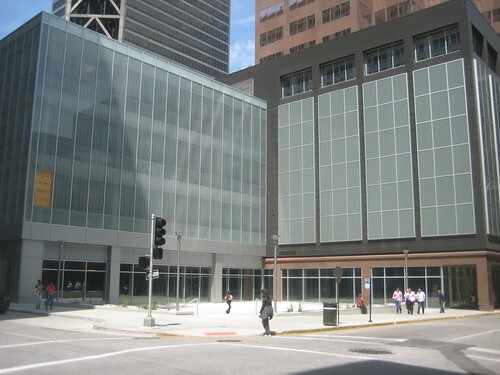 In September 2008, Thompson Coburn announced that they would remain Downtown in their present location and that a new $15 million 360 car parking structure would be built on the US Bank Plaza, which was created years earlier by demolishing the Ambassador Theater. 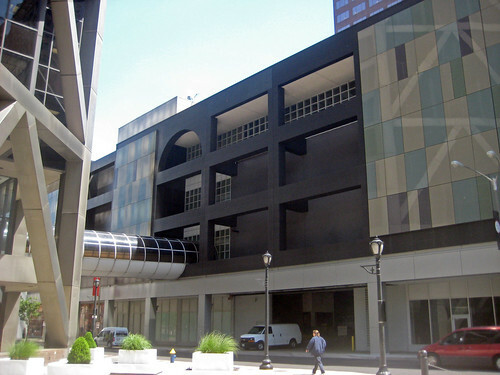 The garage would be financed by the Missouri Development Finance Board, which also brought us the Garage Mahal across from the Old Post Office at the expense of the Century Building. The demise of Pyramid Companies as well as the general collapse of the real estate market in 2008 left Spinnaker, its development partner for the former St. Louis Centre, looking for a new solution for what to do with the former mall. 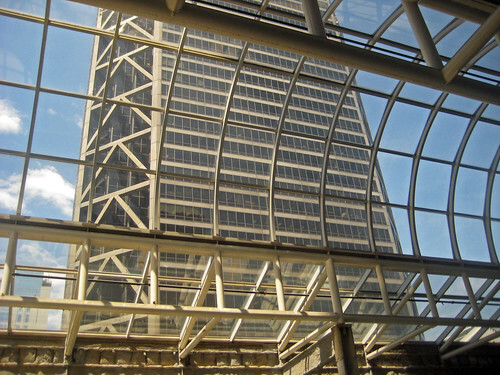 At same time, Environmental Operations Inc., which had invested heavily in the Pyramid Companies, ended up receiving ownership of the 25 story Once City Center office tower that was built over the east half of St. Louis Centre at the same time the mall opened. 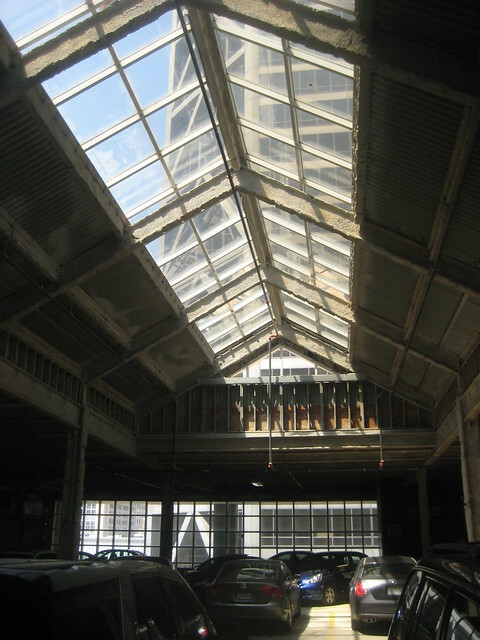 The building had been plagued with low occupancy for many years, and even though it was attached to the existing six story St. Louis Centre East Garage, in a deal to land law firm Lewis Rice, which was moving out of the tired 500 N. Broadway building and had also considered leaving Downtown, a deal was struck to provide parking in the upper floors of the former mall. 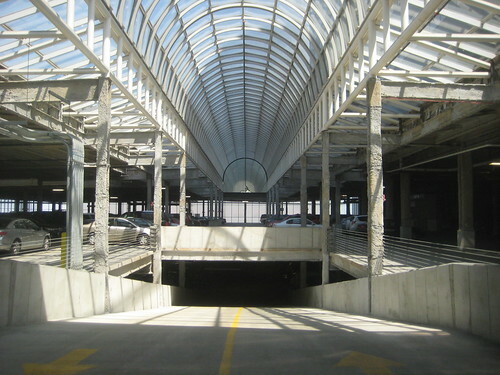 The plan announced in October 2009 would also include parking for Thompson Coburn, eliminating the need for construction of a new parking structure. The redevelopment carried forward a portion of Pyramid's former plan, which was to convert up to 100,000 s.f. 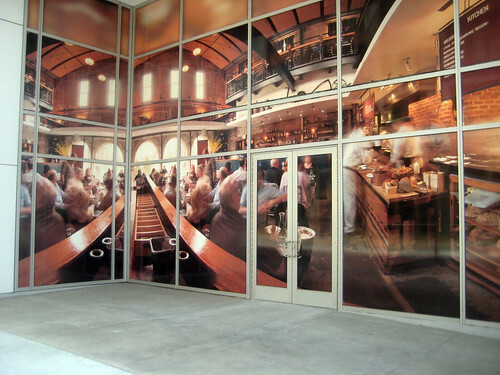 of space on the ground floor to retail space facing out to the surrounding streets as the center of the Mercantile Exchange retail, restaurant and entertainment district. Also kept in the plan was accommodation for a new three screen movie theater facing Washington Avenue on the second floor of former mall which is scheduled to open later this year. 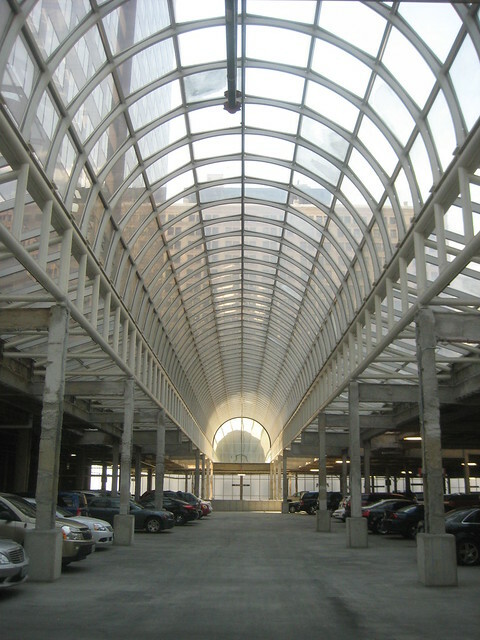 The conversion of St. Louis Centre's giant glass atriums reminds me of the classic example of the a former landmark turned parking garage, the Detroit Theater. Photo by Bob Jagendorf. 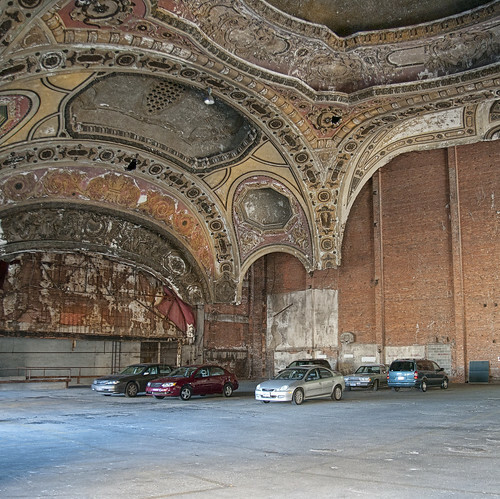 Strangely, the turning St. Louis Centre into a parking garage preserved some of the dramatic features that would have been destroyed if plans for condominiums had come to fruition. 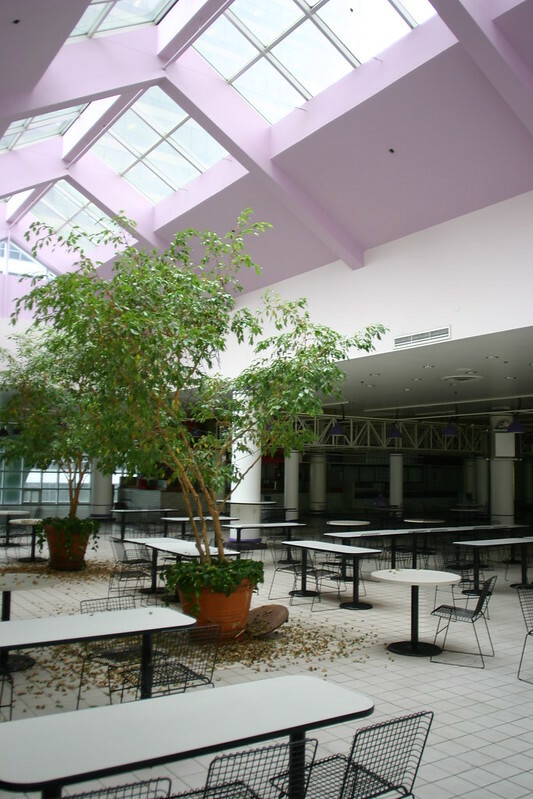 One of the plans called for an open air courtyard in the atrium space with a pool on what was the third floor of the mall. As I was photographing the garage on a recent lunch hour, I noticed two men walking around the perimeter drive aisle. After the second trip around then a third, in the same counterclockwise course, I realized that they were mall walking in the garage! It was sunny and in the mid 80's outside... some things never change. While the exterior of the former St. Louis Center building has seen dramatic changes from its cruise ship white exterior, including the addition of multicolored glass panels, along 7th street one can still see glimpses of the malls Postmodern architecture. 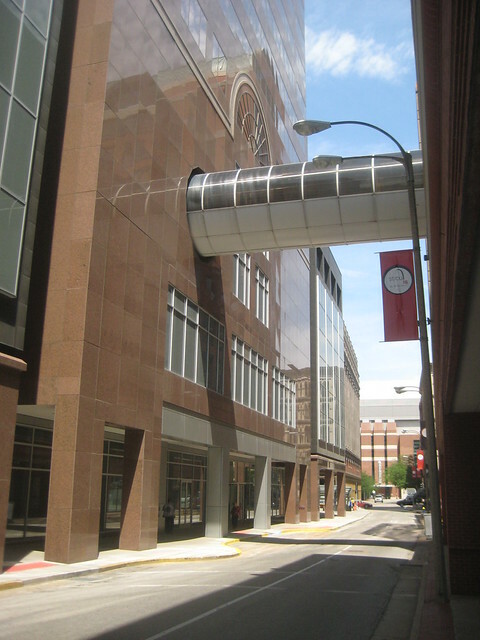 The elimination of the oppressive sky bridges and re-cladding with a white fritted glass curtain wall system has brought about a complete transformation at the Washington Avenue and Locust Street ends of the building. The new northwest corner retail storefront awaits a tenant. 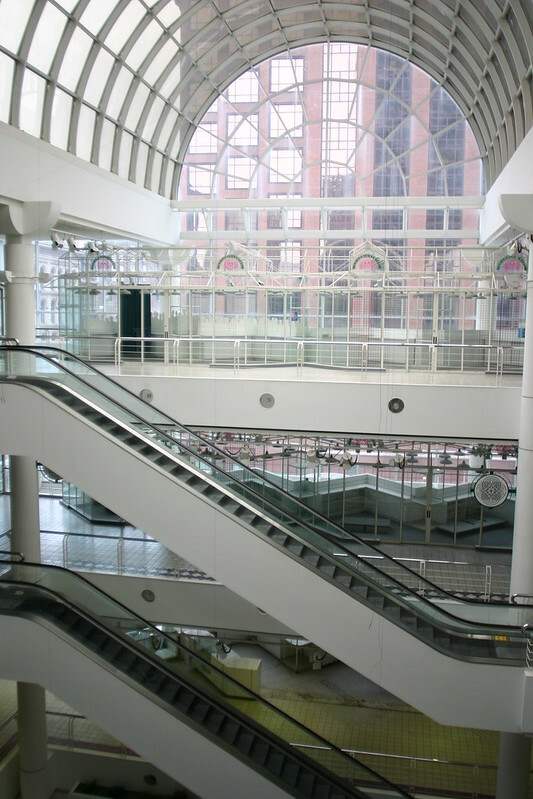 Along Washington Avenue, a terraced walk aligns with the existing series of raised floors that once led to the mall escalators at the north atrium. Across the street the facade of the former Stix Baer & Fuller department store has been fully restored ad part of mixed use Laurel development, which includes an Embassy Suites hotel, apartments, and the National Blues Museum that will hopefully open within a year on the ground floor. 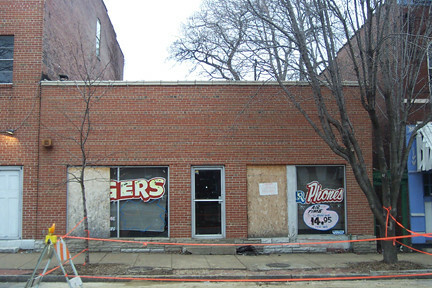 On the northeast corner, Pi is one of several restaurants scheduled to open later this year. So far there are no brick & mortar retail stores signed up to lease space. 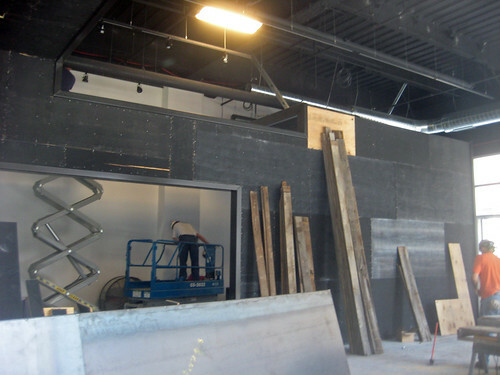 The interior of Pi's corner space at the MX is starting to take shape. 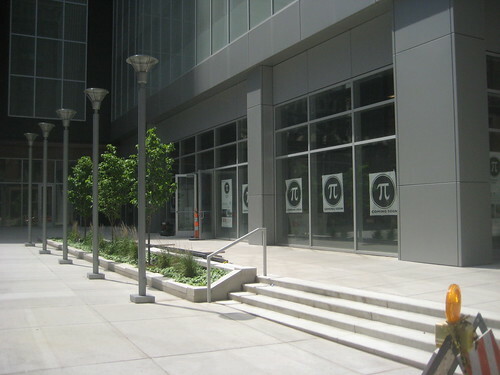 Outside Pi's space, the small plaza around the Metrolink Convention Center Station entance has been re-built including a new main entrance for the office tower, which has been re-branded 600 Washington. 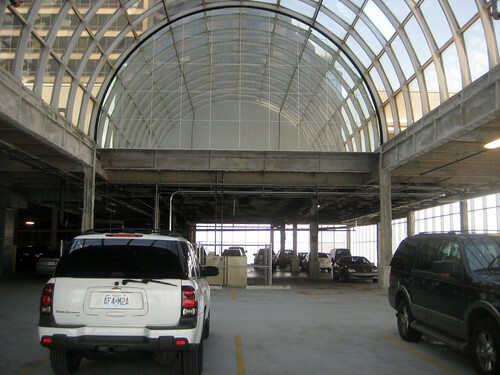 The large white steel tube and glass canopy has been removed from 6th Street, but the Habitrail tube to the adjacent six story parking garage across the street remains. 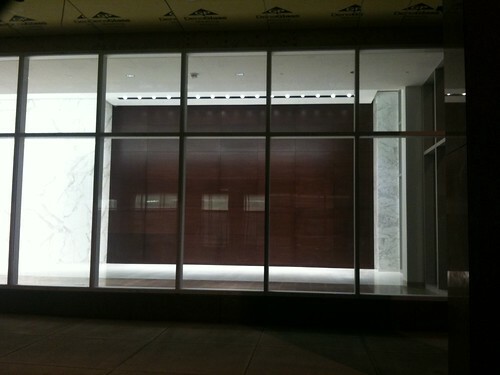 A shot of the 600 Washington lobby at night. The lobby interior features floor to ceiling walls of white Cararra marble and contemporary dark wood paneling, which now is highlighted by bright artwork. The former southeast mall entrance has also been rebuilt as a rather bland plaza that could use some serious landscaping. The plaza also features an awkwardly sloping concrete surface. The storefronts at the south end of the building still await being filled with new retail stores and restaurants, which could potentially enliven the corner. This friday there is an opening for a temporary exhibition in the southwest corner of the retail space at 7th & Locust from 4:30 to 8:00 pm. 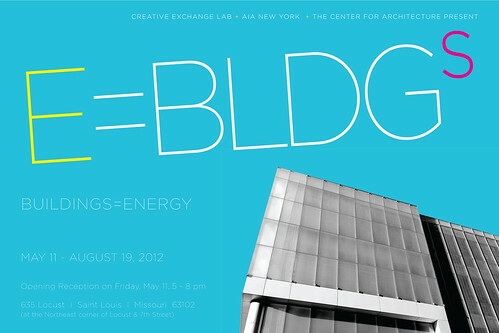 The exhibit: Energy = Buildings is being presented by the The Creative Exchange Lab, in conjunction with the Center for Architecture and AIA New York. It explores how designers, planners, engineers, government agencies and even occupants can choose energy alternatives to make our cities more sustainable. The exhibition poses a multi-angled series of questions about energy. Among them: What is the embodied energy cost of building materials? 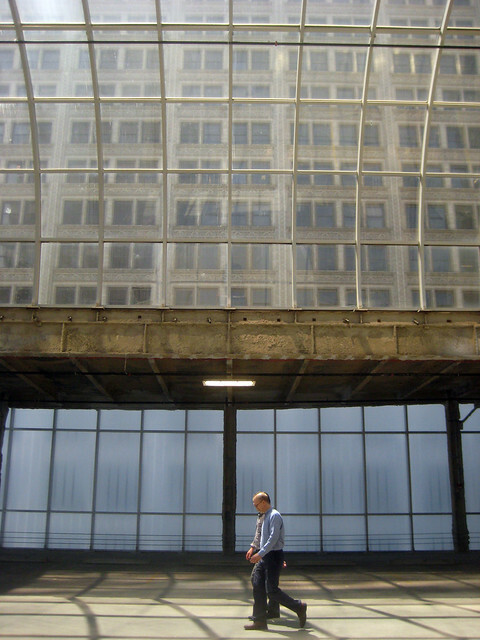 How do decisions made across a building’s lifespan affect its energy consumption? How do we best assess and analyze energy usage? More info can be found on the event's Facebook page. Last week I photographed the interior of the structure that formerly housed St. Louis Centre for the first time since the closure of the Pyramid Companies in 2008. I had avoided going there because I knew it would be a depressing experience, which it was. Before posting those photos, I realized that I last posted about the Centre's short lived good years. 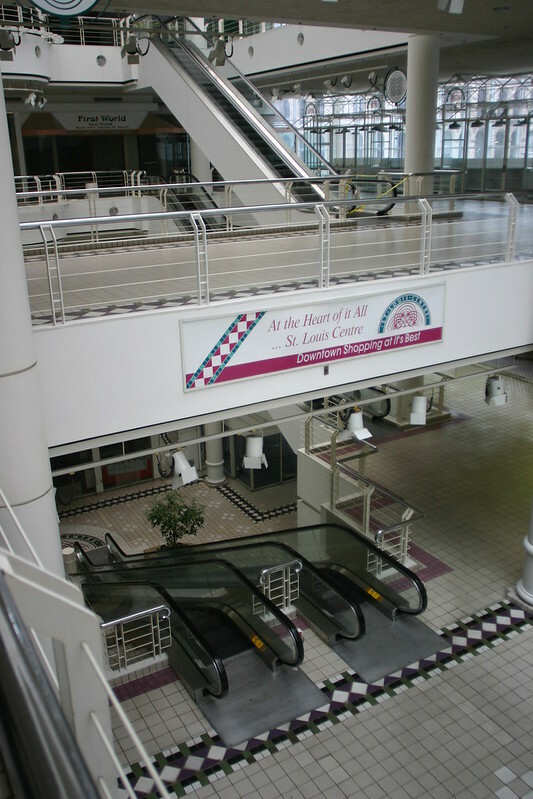 As most of you know, by the mid 1990's St. Louis Centre was on a non-stop down hill slide, never recovering from the opening of the expansion of the St. Louis Galleria in suburban Richmond Heights in 1991. The Galleria, which had opened as a redevelopment of the 1955 Westroads Shopping Center in 1986 more than tripled in size with over 100 new stores, the opening of St. Louis' first Lord & Taylor and a new flagship Famous Barr which moved from Forsyth Boulevard in Clayton. Other retailers along Forsyth similarly went into a downward spiral. 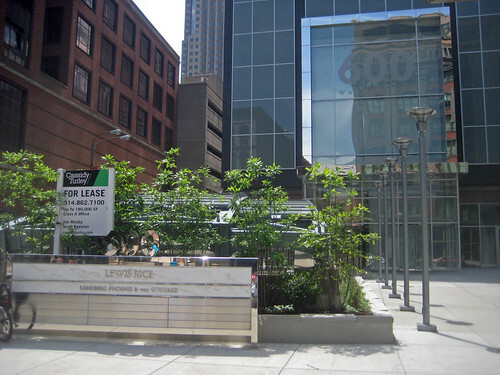 In 1996 St. Louis based retailing giant Edison Brothers Stores, which was headquartered in what is now known as One Financial Plaza just east of St. Louis Centre, filed for bankruptcy. 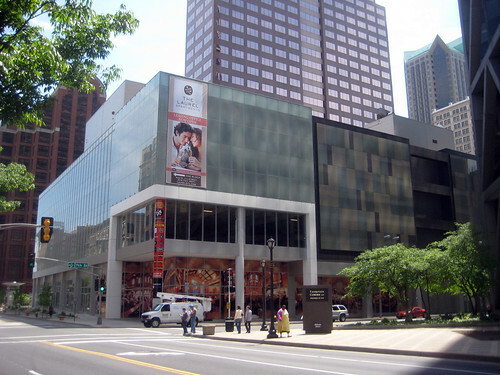 As Edison Brothers closed hundreds of stores across the country, its St. Louis Centre stores including Oak Tree, Jeans West, The Wild Pair, and 579 all closed, while newer stores at the Galleria remained open for several more years before the company was liquidated in 1999. Another major blow to St. Louis Centre was the conversion of the Dillards from a conventional department store to a clearance center. 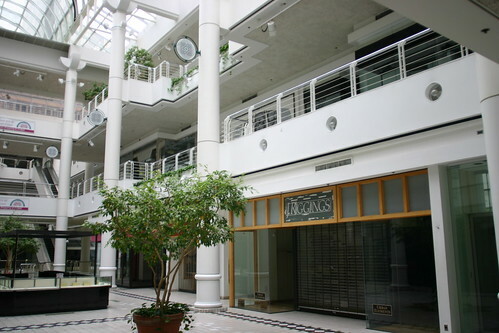 The store, which Associated Dry Goods had originally been planned for the 1985 mall opening as a completely renovated Stix Baer & Fuller with six sales floors was reduced to a three story Dillards (purchased SBF in 1984) before St. Louis Centre even opened. 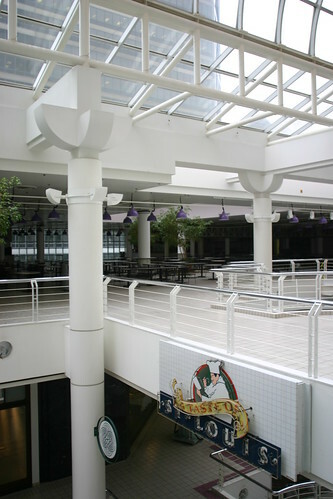 By 2001, the clearance center had been shrunk to the ground floor only, and closed entirely. By 2005 only a handful of retail tenants remained in St. Louis Centre, including Walgreens, Payless Shoes, GNC, T-Mobile, and a few others. The food court was empty except for the Chick-Fil-A, Sbarro and a Chinese Express. It was only a matter of time until the failed mall would be sold for redevelopment. 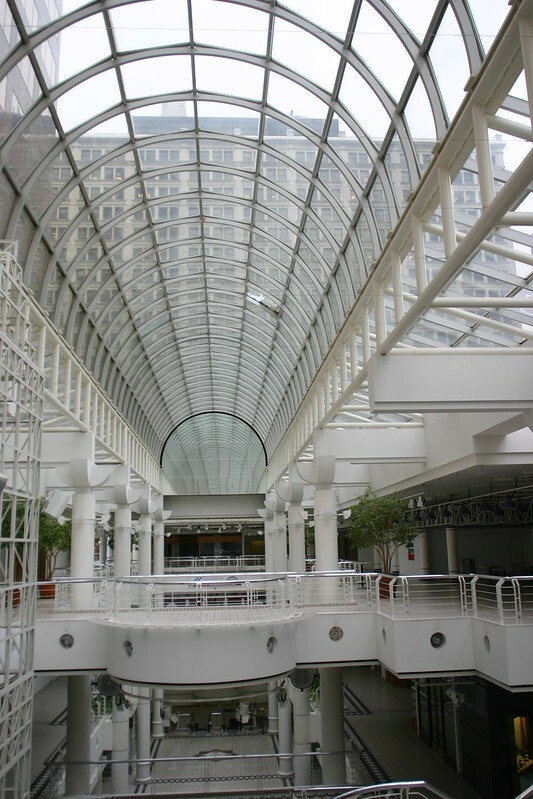 In August 2006, Pyramid Companies finally closed on the purchase of St. Louis Centre from Barry Cohen. When Pyramid first contemplated purchasing the mall a year earlier, the head of commercial development had intensions to demolish the building and start over. I convinced him that the structure of the building, which was barely 20 years old was not only sound, but that the 30 foot by 30 foot bays and 15 foot ceilings, made the building very flexible for a variety of new uses. And thus began a two and half year merry-go-round ride of looking at several different condo schemes, a residential tower addition, a new theater for the Black Rep, and the last stop in early 2008, a 40,000 s.f. ballroom for the America's Center. 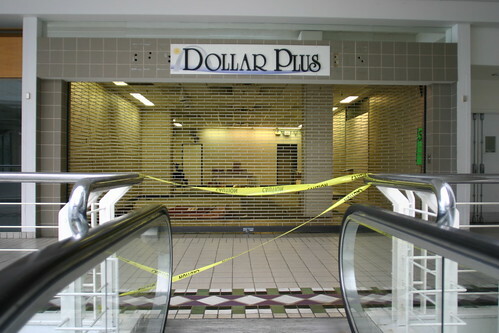 These photos were taken a few weeks after Pyramid Companies closed the mall permanently on September 15th 2006, just one month after its 21st birthday.